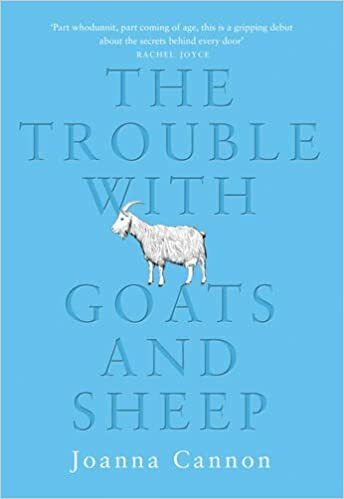 The Trouble With Goats and Sheep was published just last week and is already racing up the best-sellers list. Having read it, I can say deservedly so. It is set in the summer of 1976 which I can just about remember. It was the summer when the heatwave went on for weeks and there were water standpipes in the streets. I don’t remember that but I do live in Scotland so perhaps it wasn’t quite so hot here! One of the residents of the cul-de-sac The Avenue has gone missing and the neighbours all have their theories about what has happened to her. Ten year old friends Tilly and Grace decide to try to find her and, inspired by a Church service, they think if they can find God, they will find Mrs Creasy. I found the characters of Tilly and Grace just delightful. I loved their innocence and the way they understood everything they heard very literally. I’m not sure that ten year olds in these days of social media would be quite so impressionable but it was perhaps a simpler time. Grace was very much the stronger of the two and at times impatient with Tilly, perhaps as she feels she is growing up more quickly. The relationship between the two girls was very convincing and gave me quite a few laughs such as when they were pretending to be Brownies and Grace announced she was the sixer. When Tilly points out they’re not actually in the Brownies, Grace gives a small sigh and explains it’s important to get in character. The closeness between the two was clear and even later when Grace feels she is growing apart, something happens which makes her realise just what an important friend Tilly is. The oppressive heat of the summer of 1976 is echoed in the oppressive claustrophobic atmosphere of The Avenue. All the residents know each other so well and know secrets they are fearful will be exposed with the disappearance of Mrs Creasy. It seems that each resident has some confidence they have entrusted to Mrs Creasy or a secret they fear she has found out. In fact, they are not sure if they want her to be found! As I was reading I was wondering just what everyone had to hide and what they might have had to do with her disappearance. It shows how gossip and misunderstandings can feed on each other leading to rumours spreading. They all think they know each other so well but in fact they all have secrets and don’t know each other as well as they think. As Joanna Cannon takes us from one house to another either through the eyes of Grace and Tilly or through the eyes of the residents, gradually a picture is built up of life in the Avenue over the past few years. I thoroughly enjoyed The Trouble With Goats and Sheep. The title refers to a biblical reference that says God will separate people into sheep and goats. How will he know who is which the girls wonder and that is true of their neighbours too. There is a blurred line between the good and not so good in each resident. Gradually their secrets are revealed one by one and there are more than anyone perhaps realised. The reader gets two sides of the story, once from the girls’ point of view and then from the adults. There is humour, warmth and poignant moments and Joanna Cannon’s writing really drew me in to the lives of the residents of The Avenue. She is so skilled at creating her characters and you learn as much about them by what is left unsaid. It really is a wonderful debut novel and I look forward to reading more from Joanna Cannon in the future. Thanks for this great review – I’m just about to start reading this for my book group. Now I’m really looking forward to it! When I first heard about it I thought it sounded a bit like Maggie O’Farrell’s ‘Instructions for a Heatwave’ – all about people acting strangely due to the soaring temperatures (which I’d never heard was a recognised phenomenon until then). Oh I really hope you enjoy it. Maybe pop back and let me know? My book group are reading this after summer – wonder if we’ll get a long hot one this year? It’s been a beautiful few days which is most unusual for us! I can see why people might compare it to Maggie O’Farrell’s book which I also loved. Yes, I’ll pop back and tell you what I thought of it. ‘Instructions’ was my first Maggie O’Farrell ( a chance ‘discovery’ on the guest bookshelf of my hotel last summer holiday) and now I’m working my way through her other books. I’ve only just finished her new one,’This Must be the Place’, which I can highly recommend.